I like hiking. Particularly, I like wandering in places I’ve never been before. Sometimes only a map, a compass and a good sense of direction gets me returning to where I began. Many people on Earth enjoy this simple pleasure. But what to do if you’re on the Moon? Well, assuming you’ve got the right equipment, like a spacesuit, then all you’d need is a good map because, of course, compasses aren’t of much use. So which map do you use? Well, take a look at “The Chang’E-1 Topographic Atlas of the Moon” by Chunlai Li, Jianjun Liu, Lingli Mu, Xin Ren and Wei Zuo. This lovely, featured book will have you easily finding your way about the lunar surface. “An atlas?” I hear you asking. “Who’s going to sit down and read an atlas?” Good question, as I didn’t think I would either, but I definitely will use this book. For me, a good atlas allows me to understand the shape of the land; almost to feel the topology without actually being there. When I hike, I use maps to find interesting outlooks, amazing drop-offs or dry land between swamps. On the Moon we certainly don’t have to worry about water features. But there are many other features that are at least interesting enough to warrant a particular nomenclature according to the International Astronomical Union. This book includes eleven of such nomenclatures. For instance, there are the very dry Oceani, the Maria that hint at water courses, circular craters with astoundingly sharp edges and the knife edge rimae that slice along. How do I know of these descriptions? Simple. I look at the maps in the book. There are 188 maps each on their own page; all of them presenting an equal and fine finishing. And they include the complete Moon surface, with a space resolution of 500m, a horizontal accuracy of 192m and vertical of 120m. Actually, that’s most of the book. There’s an appendix. It includes a list of 3,698 features placed on the maps with each feature having; its name, its latitude, its longitude, its size in kilometres and its page. With this appendix, one can quickly and easily find the common lunar geographic features. There are a few pages of introduction. And that’s all. It’s just like an atlas should be; straightforward, simple and to the point. I bet you’re wondering about where the data came from? The title says it all. 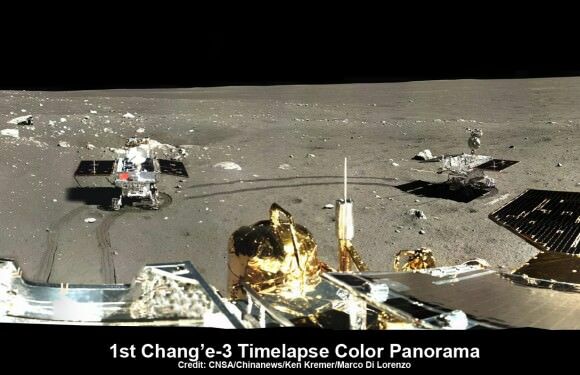 It’s from China’s Chang’E-1 probe. This book is a re-issue in English of their initial production of 2012. Nicely located in the preamble is a description of the data processing. This includes specifications of the CCD camera, the characteristics of the probe’s orbit and the actual data processing. It’s apparently no mean feat, as the data came from a three-line array CCD stereo imager and resulted in the Mercator or Azimuthal projections. Some additional information is at this link (in English). However, what’s most impressive for me is that this book shows that China is actively and capably adding to the scientific knowledge of space. Yet, in acknowledgement to lunar mapping already done, the authors included a very informative history of lunar mapping in the book’s preface. So you get to know both where this mapping data came from and where other data may be found. In any case I suspect that you nor I will be going hiking on the Moon anytime soon. But perhaps you want to study lunar topography, lunar morphology or lunar geologic structures? Maybe you want to know where is the water that’s hiding on the Moon. I recommend “The Chang’E-1 Topographic Atlas of the Moon” by Chunlai Li, Jianjun Liu, Lingli Mu, Xin Ren and Wei Zuo. It may guide you to all sorts of interesting features and finds. The book is available through Springer.